Daniel Ellsberg, Patricia Ellsberg, and filmmaker Judith Ehrlich, answered questions after a sold out screening of the Oscar nominated documentary, 'The Most Dangerous Man in America: Daniel Ellsberg and the Pentagon Papers' at the Embarcadero Center Cinema in San Francisco. 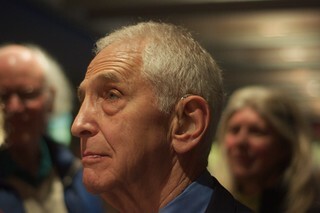 Ellsberg is appearing at as many screenings of the film as possible because he thinks it could inspire people to tell the truth. He had just come from the east coast, so it was like answering questions after 1 am. He also said Afghanistan Ambassador Karl Eikenberry's cables which were leaked to the New York Times should get more attention, and congress should call Eikenberry to testify about them under oath. Ehrlich said Ellsberg will be turning 79 this year and had been arrested 79 times at protests, and they hoped to have a special celebration for his birthday. People talked to Ellsberg and asked him to sign copies of his book, ' Secrets: A Memoir of Vietnam and the Pentagon Papers' until he had to introduce the next screening.